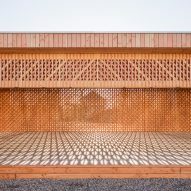 Architecture students from Germany's University of Kaiserslautern have built this wooden community centre for a refugee camp in Mannheim, which is fronted by a latticed screen. 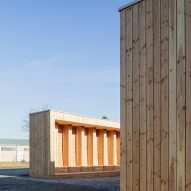 The pavilion, designed by students Sandra Gressung, Sascha Ritschel and Tobias Vogel, provides a sheltered communal area for refugees arriving in the camp located on the former US Army's Spinelli Barracks in Mannheim. 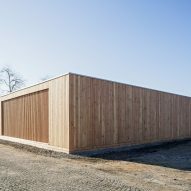 Eighteen students from the University of Kaiserslautern's architecture department worked with 25 refugees and local building companies to build the centre in three months. "Due to bureaucratic procedures, refugees arriving in Germany are condemned to sustain a long period of passiveness," said the team. "They are well provided with the bare essentials but the immediate area is quite desolate and lacking of quality common spaces." "The residents at the preliminary reception centre had the opportunity to actively shape their environment and create a quality place for common or individual use," they continued. Aside from creating the pavilion, the Spinelli project also aimed to provided refugee volunteers with basic building skills. "The refugees improved their knowledge of the German language, experienced conditions and working standards in Germany and acquired new skills which will be useful even if they can't stay in Germany on a permanent basis," said the team. 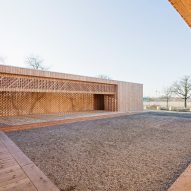 The centre is made up of a series of courtyards and covered spaces, which are oriented towards the tree-lined road and open fields west of the camp. 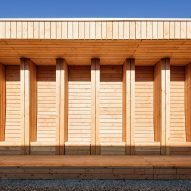 Cross-laminated timber walls, which are clad in Douglas fir, make up the main walls of the centre, while the latticework walls provide structural support. 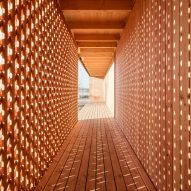 They also create a dappled lighting effect against the spaces behind. 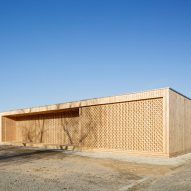 "Structural elements, wall and ceiling surfaces, flooring and furnishings are made of untreated timber," said the team. "Its intimate warmth, aesthetics and haptics acts as invitation." "The ornamental structure with its varied play of light is recognised by the refugees as a reminder of oriental ornaments, and as an inviting gesture of identification in a foreign place." The large outdoor events space has south-facing seating niches built into the wall on side. The seats are protected from the rain by a two-meter-wide canopy and partitions between the niches. 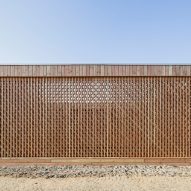 A latticed screen overhangs on the front of the sheltered common room, which features a raised platform and can be used as either a stage or auditorium. A 14.5-metre-long gridded screen backs this space. Another screen overlaps the wall, to disguise the entrance to the garden courtyard for retreat and silence. 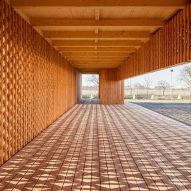 The area is completely enclosed by four walls apart from the 7-metre-wide latticework opening that brings light into the space. The centre also features two storerooms that will be used as a kiosk and workshop in the future. In order to build structural elements like walls and roofs in the short period of time, large-format components were prefabricated in an unoccupied hangar at the former military facility. This protected the structure from moisture during processing and enabled the elements to be assembled on site quickly and precisely. 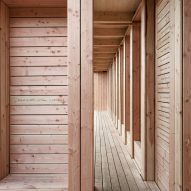 The refugee crisis has become an increasingly important topic for architects and designers, who have unveiled a multitude of proposals for shelters including rapidly deployable hexagonal dwellings and adaptable shelter systems. Photography is by Yannick Wegner.